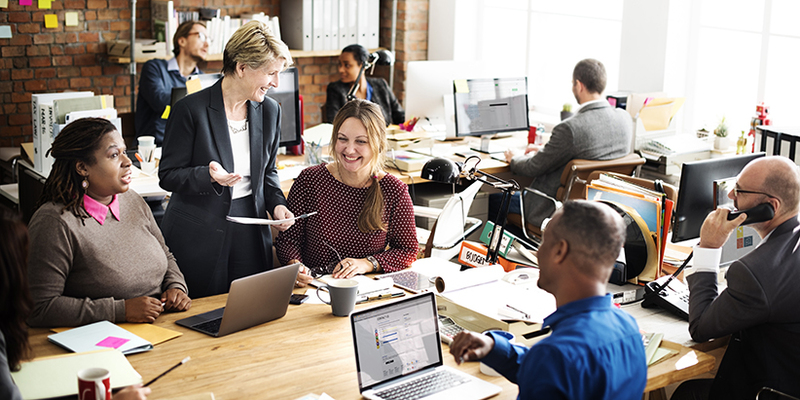 Most I.T and business professionals can easily rattle off the many benefits of a cloud-based call center: the scalability, the lower TCO, the flexibility and mobility and more. 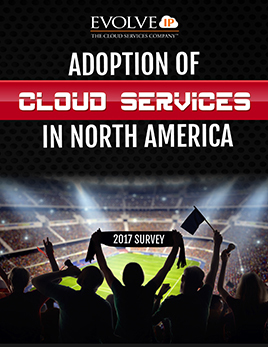 But are you aware of the key considerations that can help you determine if your call center business is ready to take advantage of the cloud? In this blog series, we will talk about the most critical things that you should know before moving to the cloud. In part 1 today, we will touch upon Call Quality Challenges, QoS and why it matters. We need quality calls to keep our customer satisfaction high but today, we are not going to talk about that kind of quality. We are literally talking about the quality of the voice connection between the caller and members of your organization. Although mobile phones have become very ubiquitous in today’s society, we all experience regular issues where calls are choppy, garbled or seem like we are talking to a person on the moon via a tin can. THAT is the quality we are talking about. 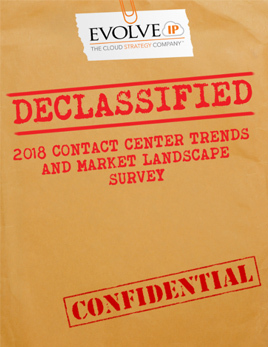 I can boil this conversation down to 1 major decision-are you connecting to your cloud contact center via a private network? In other words, do you purchase connections to the cloud service provider (from them or a third party carrier) that is dedicated to just handling your voice traffic. This is a private connection between you and the underlying technology platform. 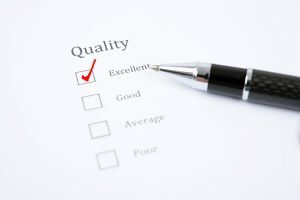 The reason you install a private connection is to guarantee what is called Quality of Service or QoS (more on this in a moment). Through a private connection you are able to completely control the technology elements that can negatively impact the quality of your calls. 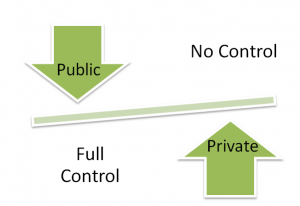 The other option is to use the public internet to connect to the cloud. You basically “plug in” to the internet and ride those connections that are shared by your neighbors, other businesses, and all those media streaming social medialities out there. You simply are riding the waves of the internet which when untamed is the wild wild west. 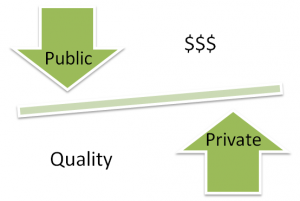 So what is Quality of Service (QoS)? QoS has several technology elements that I won’t bore you with today since you all have access to Google, just search for QoS to learn about all the gory details. 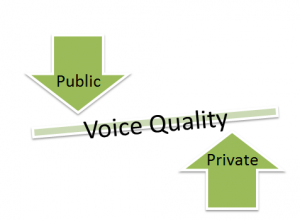 QoS in a nutshell is about ensuring the priority of your voice traffic. Your voice travels in small chunks called packets. If those packets get delayed or some take a circuitous route and arrive out of sequence then your calls will become garbled or choppy. With QoS, the network prioritizes those packets just like you and I prioritize our day but it does it in real-time in Nano-seconds since voice traffic demands a high-quality connection. The network that is handling your voice packets needs to have intelligence to give those packets priority over others that can be delayed. If the network is getting congested, QoS will delay your web search a few milliseconds through this intelligence, you’ll never know that was done and the network has preserved the quality of voice call by prioritizing it over the web search. Similarly, a heavy streaming download can be slowed down to make bandwidth available for the voice traffic that needs to “leap frog” ahead because it’s more important and simply can’t be delayed. Even the transaction that is being conducted inside one of your business applications can be modified by the network since nothing is important as that voice call. A private network gives you QoS. It understands the different types of traffic and prioritizes them accordingly. When your voice traffic travels a public network without any specialized help there is no prioritization, no intelligence and all traffic is basically treated of equal importance. The end result is sporadic periods where calls are choppy or difficult to understand the other party. So why would you use a Public Internet connection to handle your voice traffic?? WELL, it’s darn cheap!! That’s why! The availability of very high bandwidth at dirt cheap prices makes it very compelling! Private networks cost more money for much less bandwidth…..but you can control them….and apply that QoS intelligence to ensure high call quality. So why can’t I get QoS over the Internet? It’s a conglomeration of many interconnected networks that aren’t smart enough to support QoS. Each request you make on the web may take a different path depending on what’s going on at that moment in time. That’s the nature of the Internet. If you call Comcast or Verizon Tech Support and tell them you are having a problem with voice connection on their network to a cloud call center, they aren’t going to be able to help you. They are likely to offer to sell you their services but they won’t help you resolve your voice quality issue. There is NO CAVALRY when riding the Internet. Or is there? Stay tuned for Part 2 of our blog series to learn about a solution that allows customers to have their cake and eat it too i.e. have their QoS and cheap internet connections too. 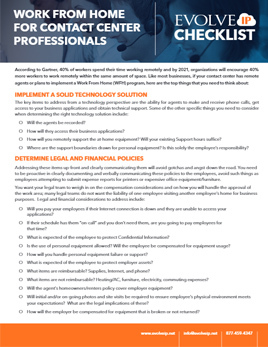 Don’t forget to download our complimentary resource on the Hidden Benefits of a Cloud-based Call Center to learn more about moving to the cloud. 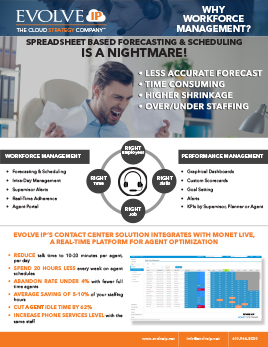 At Evolve IP, I'm the Contact Center Director, which means I help organizations use cloud technology to provide enterprise class telephony, network, and security solutions. While my experiences vary from IT strategy to technology infrastructure and project management, I have a special talent for call center development. After so many diverse experiences, I can spot an organization that doesn't even know it's a contact center but needs to operate like one. For example, at PHH Mortgage I helped transform the sales division into a contact center. From concepts to workforce management to reporting, this approach helped our teams more effectively answer calls and increase revenue. We saved money just by getting the phone answered by the right person. When I'm not helping call centers optimize their performance, I'm either enjoying time with my family -- I have three kids -- or swimming laps, cycling, and running as I train for my next triathlon.